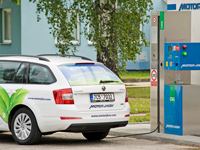 May 2017 – According to testing by the German ADAC auto club, the Škoda Octavia G-Tec running on compressed natural gas vehicle is more environmentally friendly than the acclaimed electric Tesla Model S, for example. The Octavia G-TEC CNG is the only non-hybrid and classic car with a combustion engine, which received a five-star rating in the test, while the Tesla Model S received four stars. For example, even the Toyota Yaris Hybrid CNG ranked behind Škoda. The ADAC also noted that modern direct injection turbocharged gasoline engines show a high proportion of particles. Their emissions often exceed the measurement for diesel.